The housing market was a major contributor to economic and market performance last quarter. Housing prices are increasing across most of the country, and a February report shows that permits for future construction increased at the second-fastest pace seen since June 2008. [v] Unemployment has also seen some recent improvement, with the latest report showing that jobless claims decreased in 22 states while wages increased in 42 states, yielding an unemployment rate of 7.7% in February. [vi] Overall, the economy still has a ways to go before it can be considered fully recovered, but the trends indicate that the recovery is continuing at a strong pace. The Eurozone debt and economic crisis remains of deep concern to analysts and investors. While the Cyprus banking situation was resolved with a 10 billion euro loan by raiding depositors’ bank accounts, EU officials have set a bad precedent that may have long-term effects on their banking sector. [vii] The IMF issued a recent report warning that ongoing political wrangling and piecemeal bailouts are threatening the stability of the Eurozone and that cooperative, comprehensive action was needed. [viii] Currently, both Italy and Spain are close to needing bailouts, as interest rates on their debt is rising to untenable levels and the political leadership in each country lacks the credibility necessary to push through needed reforms. It’s important to keep market milestones in perspective; while we are very pleased that the economy is steadily improving and markets are doing well, we know that the music will stop sometime. In the days and weeks to come, markets may experience volatility as investors take profits and wait for good news. Historically, markets have often underperformed in the second quarter after a big first quarter. [ix] Analysts will be closely watching first quarter earnings reports and economic data, along with monitoring Europe for clues on which way the market will go. However, if economic fundamentals remain solid, markets may experience further upside. 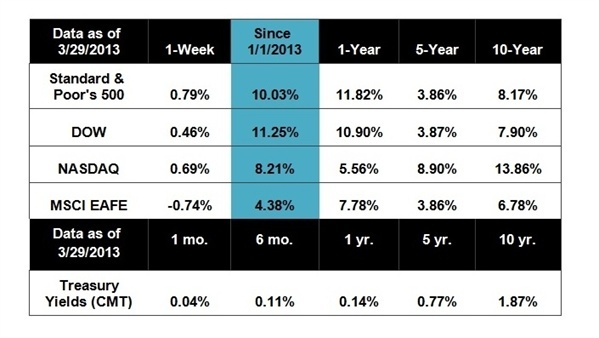 While we continue to remain optimistic about market performance in 2013, we counsel our clients to expect some bumps in the road. If you have any questions about your investments or how your portfolio should be positioned for the rest of 2013, please don’t hesitate to contact us. We are always delighted to be of service to you and your family.